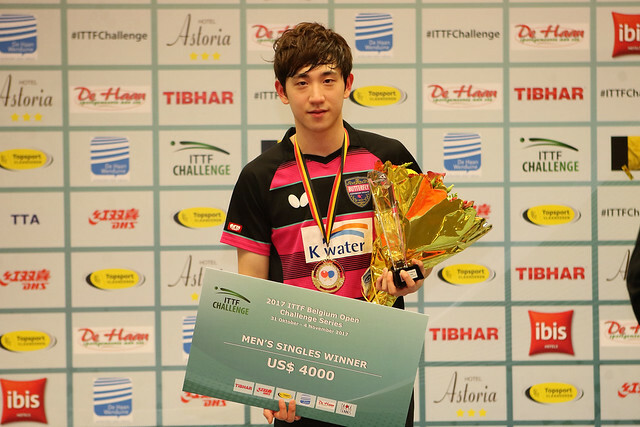 Canada’s Marko Medjugorac and Frenchman Rémi Menand were the surprise names to book third round places in the Under 21 Men’s Singles event at the 2017 ITTF Challenge Belgium Open in De Haan on Thursday 2nd November. Conversely, the biggest casualty was Russia’s Sadi Ismailov. Required to compete in the qualification stage of proceedings, Marko Medjugorac was the man the live on the proverbial knife edge; success by the minimal two point margin in the deciding game against Aliaksandr Khanin of Belarus, the no.13 seed (11-8, 7-11, 12-10, 4-11, 13-11) was followed by a similar tension packed victory over England’s Tom Jarvis, the no.24 seed (8-11, 11-9, 9-11, 11-9, 11-9). Similarly, Rémi Menand, who also had been required to compete in the qualification phase, caused Belarus problems but he succeeded in a less dramatic fashion. He accounted for Gleb Shamruk, the no.32 seed (11-13, 11-8, 11-8, 11-7), after having in the opening round beaten Puerto Rico’s Brian Afanador, the no.12 seed (11-9, 15-13, 11-5). Delight for Marko Medjugorac and Rémi Menand, despair for Sadi Ismailov; the no.3 seed; after accounting for Damien Llorca of France (11-7, 11-1, 11-9), he was beaten by Germany’s Dennis Klein, the no.19 seed (11-5, 9-11, 12-14, 11-9, 11-4). Success against the odds in the second round of the Under 21 Men’s Singles event for Dennis Klein; he was not alone in causing upsets. In addition, Sweden’s Simon Berglund, the no.21 seed, beat Chinese Taipei’s Sun Chia-Hung, the no.5 seed (11-6, 7-11, 11-8, 11-3); Japan’s Masaki Takami, the no.17 seed, accounted for Slovenia’s Deni Kozul, the no.7 seed (11-5, 11-5, 11-6). Likewise, in form was Tobias Hippler, the no.30 seed and like Dennis Klein from Germany, he ended the hopes of Hungary’s Adam Szudi, the no.8 seed (11-4, 11-5, 5-11, 11-6). Meanwhile, not to be left out Jules Rolland, the no.31 seed, added to French success and inflicted more pain on Hungarian efforts as did Japan’s Yuta Tanaka, the no.27 seed. Jules Rolland beat Bence Majoros, the no.10 seed (9-11, 8-11, 11-8, 11-7, 11-7), Yuta Tanaka, halted the aspirations of Nandor Ecseki (11-9, 11-8, 7-11, 11-5). Surprises but not where the top two names were concerned. Hong Kong’s Lam Siu Hang, the top seed, reserved his place in round three by overcoming Spain’s Miguel Vilchez, the no.28 seed (11-6, 7-11, 11-9, 11-7); in a similar vein, Slovenia’s Darko Jorgic, the no.2 seed, defeated qualifier Leo de Nodrest (11-4, 11-6, 7-11, 11-8). Also, in a similar vein, Ng Pak Nam, like Lam Siu Hang from Hong Kong and the no.4 seed, reserved his place in round three and emulated Darko Jorgic. He stifled French progress; he beat qualifier Nolan Givone (1-11, 11-7, 11-9, 11-7).